Sony HT-ST3 review | What Hi-Fi? Manufacturers seem to be cramming as much as they can into soundbars nowadays. The result? Bigger soundbars. But the Sony HT-ST3 has taken a different approach. Despite hosting a generous set of connections, it’s fairly inconspicuous. It’s a stick of aluminium alloy with 11 tiny drivers covered by a stainless steel grille – the angular, rock crystal-inspired design of Sony’s 2013 products is carried over here, and we like it. Best of all, there’s no need to worry about blocking the bottom of your telly. 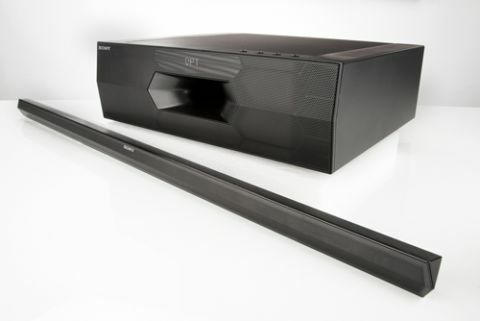 At 4cm high it’s one of the slimmest soundbars we’ve seen. Sony has achieved this slim profile by taking as much as possible out of the soundbar and shoving it into the wired subwoofer, which handles all connections and processing. It’s an AV receiver-sized box with two 10x15cm cones, a front-firing reflex port and a small display. Connectivity is good. There are four HDMI ports (three in, one out), two optical inputs and one for analogue audio. You also get NFC (near-field communication) for easy Bluetooth pairing. The HT-ST3 also supports the higher-quality aptX variant of the tech. This Sony soundbar will fit nicely under pretty much any TV, but the subwoofer is trickier. Its size, shape and physical ties to the bar make it a little awkward to stow. Lay it down next to your system, like you would with a regular subwoofer, and it looks like it’s being isolated as a punishment. Standing it vertically is an option, but you’ll have a sideways display. Really, it wants to be on your AV rack. This will subject the rest of your kit to extra vibrations, but it’s the neatest option if you have the space, and will result in the best integration. The top of the subwoofer has the main controls: power, input, volume and Bluetooth pairing. For everything else you’ll need the remote control – a thin stick with angular buttons. It’s easy enough to use, but the unit doesn’t feel particularly substantial. The bottom part of the remote slides out to reveal some additional keys. These are smaller and fiddlier than the main buttons, and the sliding cover comes off with minimal coercion. We’re a bit disappointed when it comes to the sound. The HT-ST3 doesn’t greatly improve the sound of your TV, which we feel is the primary reason to get a soundbar. The bar itself sounds hard-edged and small – not unlike a typical telly. The subwoofer does sound muscular and fairly well defined, and the integration between the two parts is decent. There’s a fair amount of detail, but unfortunately crispness turns to hardness when pushed. Even with everything optimised, this package still falls short in delivering dynamics, and the sound isn’t particularly expressive. There are a good number of options for adjusting its character. Let’s start with sound modes: ‘Standard’ is for regular TV viewing, while ‘Movie’ adds bass. ‘Music’ fills out the midrange a little while flattening the overall response. ‘Football’ gives you a stadium vibe: the sound is better spread but speech isn’t as distinct as it might be. Elsewhere, Voice Level gives you three options for dialogue clarity, while SW Tone does the same for bass dynamism. We spent a long time optimising the performance. It was impossible to get a sound comparable to the Award-winning Philips HTL9100, which has a large-scale sound with good balance and excellent integration. The Sony’s flaws were slightly less apparent when playing music through Bluetooth, but the same issues persist. The Sony HT-ST3 is a mixed bag, with some very good ideas let down by frustrating implementation. It looks nice, and we like the connectivity, but its audio performance needs work. Ultimately, it barely sounds £600 better than a flatscreen display, and it’s only the decent levels of detail and integration that save it from a two-star verdict. This was originally published as a two-star review in the December 2013 issue of What Hi-Fi? Sound and Vision. Sony has supplied a later production sample and the review has been updated accordingly.